CLIENT: Jamestown. SCOPE OF WORK: Adaptive Reuse. Architecture. Interior Design. SIZE: 21 100 000 SF. LOCATION: 675 Ponce de Leon Ave. Atlanta. Georgia. STATUS: Built 2015. AWARDS: Urban Land Institute Global Award for Excellence. 2016. Urban Land Institute Atlanta. Project of the Year. 2016. Golden Shoe Award. Pedestrian Environmental Data Services. 2016. LEED Gold Certification. S9 Architecture designed and master planned Atlanta’s Ponce City Market, a former Sears, Roebuck & Co. distribution center re-envisioned as a vibrant community space and a model of urban redevelopment. This 21 million-sf mixed-use complex for Jamestown saw a neglected historic property adapted into a site that knits together the surrounding neighborhoods, enhancing their character with 300,000 sf of curated retail and dining options, 300 residential units, and half a million sf of flexible office space. 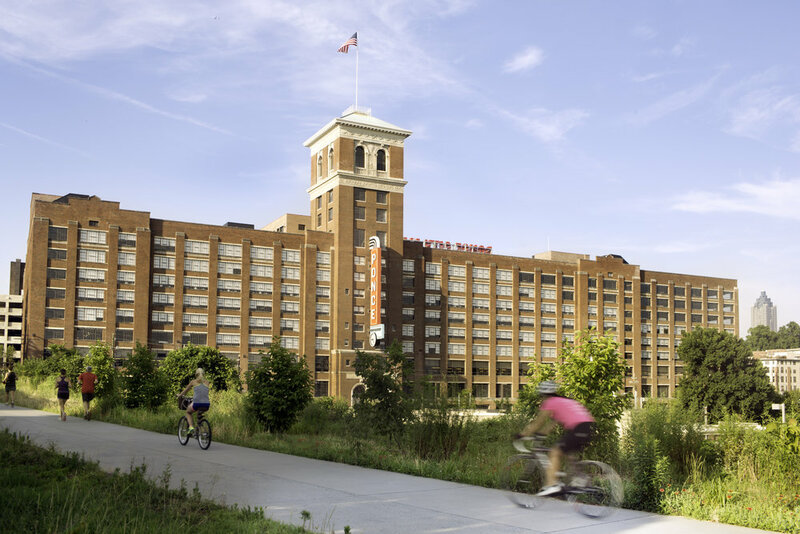 The complex connects directly with the city’s BeltLine multi-use trail, linking Ponce City Market with the larger urban context to create an innovative shopping, dining, and entertainment destination for all Atlantans. The original early 20th century building had expanded over the decades, forming an impenetrable super block at the center of four residential neighborhoods. S9 Architecture used creative interventions to modify the site into a porous public crossroads, accessible from all sides. Novel aspects of the building’s additive architecture were activated as opportunities for place-making. A public courtyard, passageway, trestle and bridge excavated from the existing structure provide moments of discovery, add public green space, and establish pedestrian and bicycle access from the street-scape to the elevated BeltLine. A double-height marketplace acts as a gathering place packed with local food and boutiques, while on the roof, an adult amusement park offers vintage carnival games and panoramic vistas. The building’s history and function are celebrated through the interior design which features original freight elevators and support columns and painstakingly restored antique floors and windows. S9 Architecture’s planning and revitalization of this massive complex exemplifies how considered design can enrich and connect communities within urban settings. 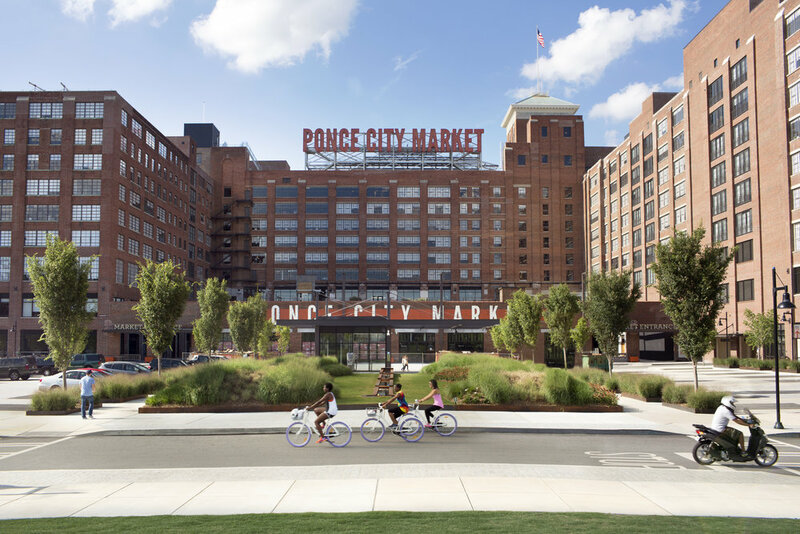 As the largest adaptive reuse campaign in Atlanta’s history, Ponce City Market preserves a historic icon of the Old Fourth Ward, reinvigorating the site and surrounding neighborhoods with an exciting and ever-shifting mix of experiences.